The Class and Component prices for April were positive. All dairy commodity and components prices were positive except for milk protein, which was negative only because butterfat prices were up. 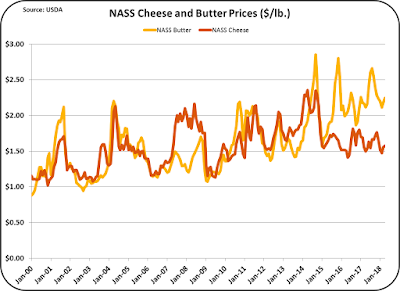 Higher butter and butterfat prices do not significantly change the Class III price, they only move the value of the components that make up the Class III price from milk protein to butterfat. (See this post for details.) The biggest change was in the value of "Other Solids." This followed an increase in the price of dry whey, the basis of the "Other Solids" pricing. However, the price of "Other Solids" is still a small fraction of the prior year pricing. In April of 2017, "Other Solids" were worth $.34/lb. In April of 2018, they were worth $.06/lb., a drop of 82%. Cheese and butter prices were both up. As a result they maintained the on-going price spread between them. Since late 2015, butter has been worth significantly more than cheese. The average spread for the last three and a half years is $.67/lb. 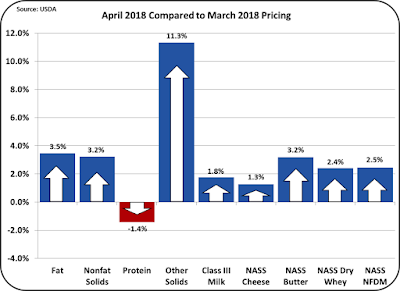 The price spread for April 2018 was $.65/lb. 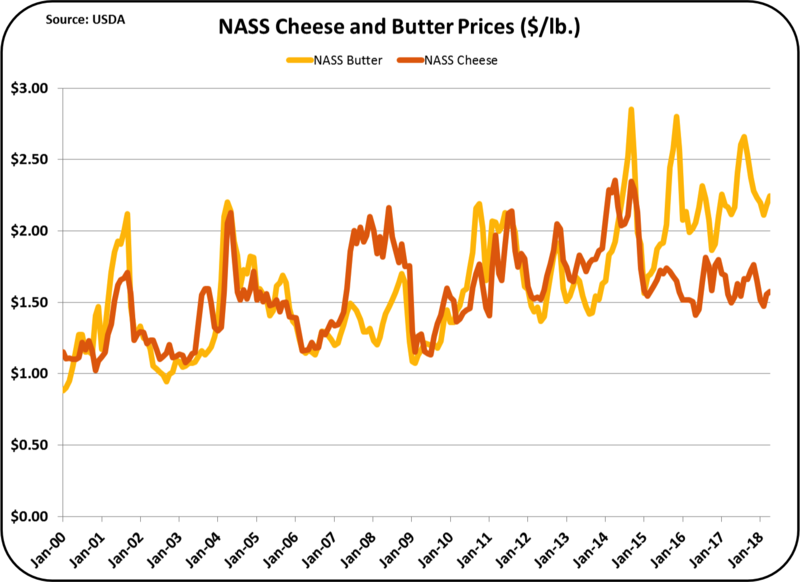 As covered in the March 4 post, higher butter prices and the spread between the cheese and butter prices no longer appears as an abnormality, but as a new "normal". Inventories continue to be an issue. 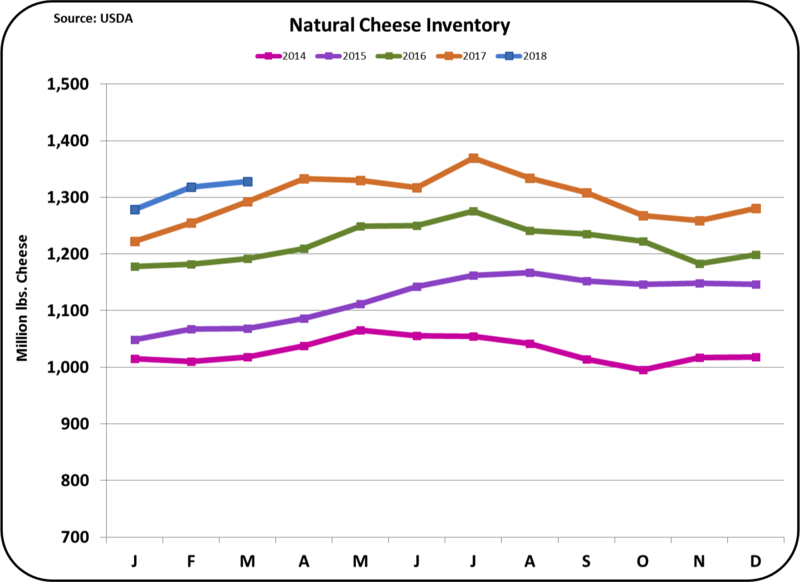 Chart III below shows the cheese inventory levels for the last five years. 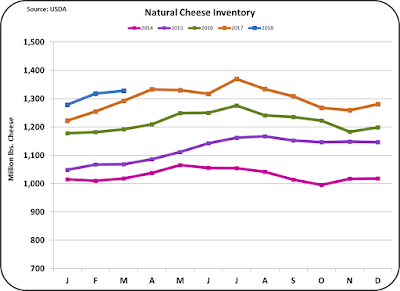 The most current data shows another increase in the inventory of cheese. While cheese inventory levels should grow with growth of domestic consumption and exports. However, production of cheese has outpaced the disappearance of cheese. Domestic consumption of cheese grows about 2% per year. Exports have been up and down. Production of cheese has increased by 4% in 2017 over 2016 and cheese production continues to increase at a 4% rate in 2018 compared to 2017. Cheese exports continue to improve, but still have a way to go. March Exports showed improvement, but they are still well below the levels of late 2014 and early 2015. The next 5% program underway at the USDEC is extremely important to reducing the current cheese inventory levels. More current details on exports and imports will be provided in an upcoming blog. 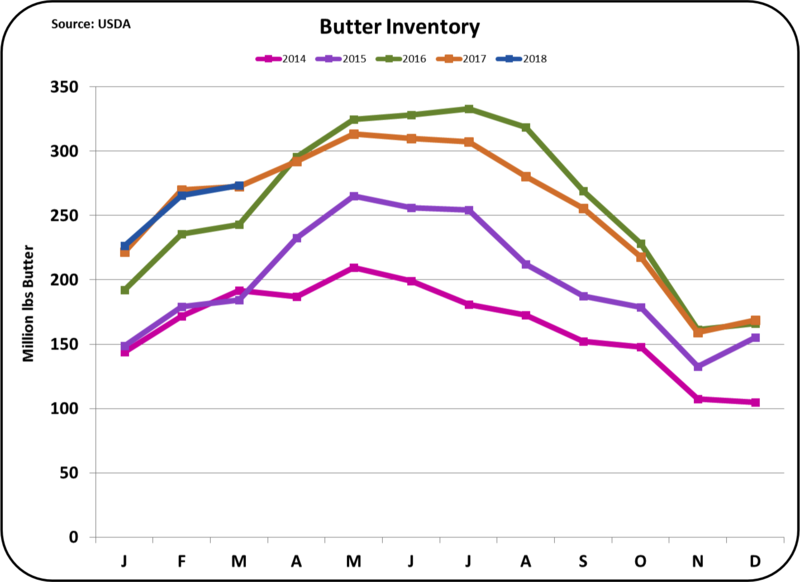 Butter inventories remain very close to the prior year in-spite of greater consumption. 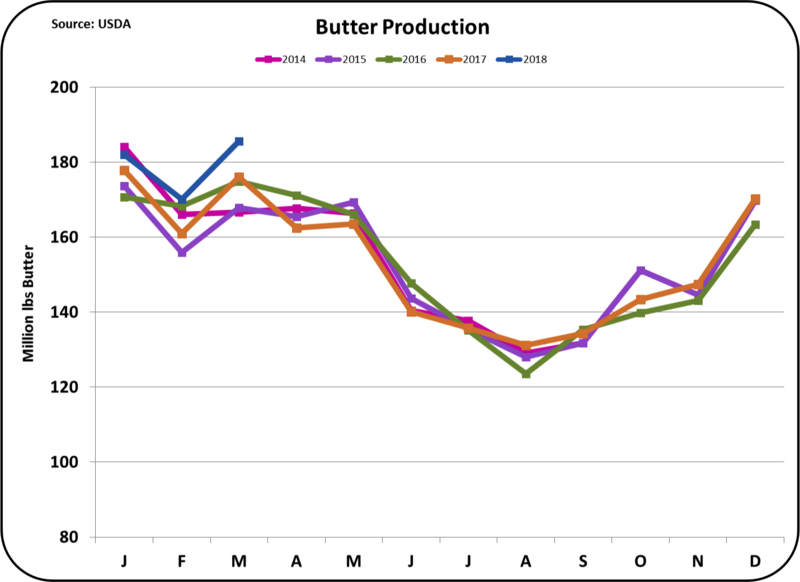 Butter consumption is growing about 2.6% annually. (See March 30 blog post.) With no growth in inventories, there is a shortage. 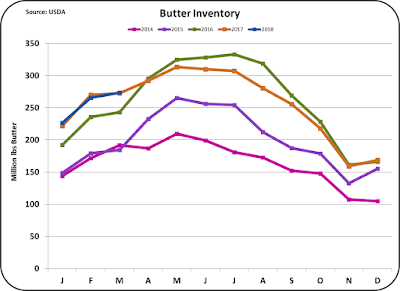 The shortage in inventory is driving the high butter prices. Production of butter is finally starting to show growth. March churning showed growth not seen in years. Is this an aberration or is it a new trend? 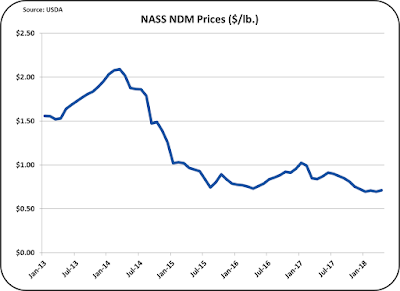 If it is a trend, it may help increase inventories, but it will also leave more skimmed milk to deal with and there is already a global glut of Nonfat Dry Milk/Skimmed Milk Powder (NDM/SMP). Future posts will continue to monitor this. 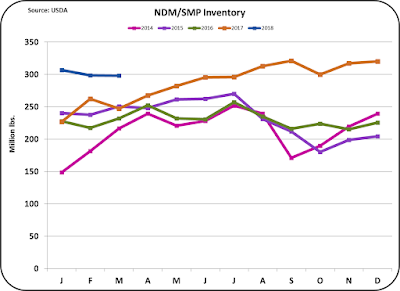 Inventories of NDM/SMP are already high and could continue to grow. Exports continue to grow (slightly), but they have still not reached the late 2017 level. The current March ending inventories showed no change from the prior month. 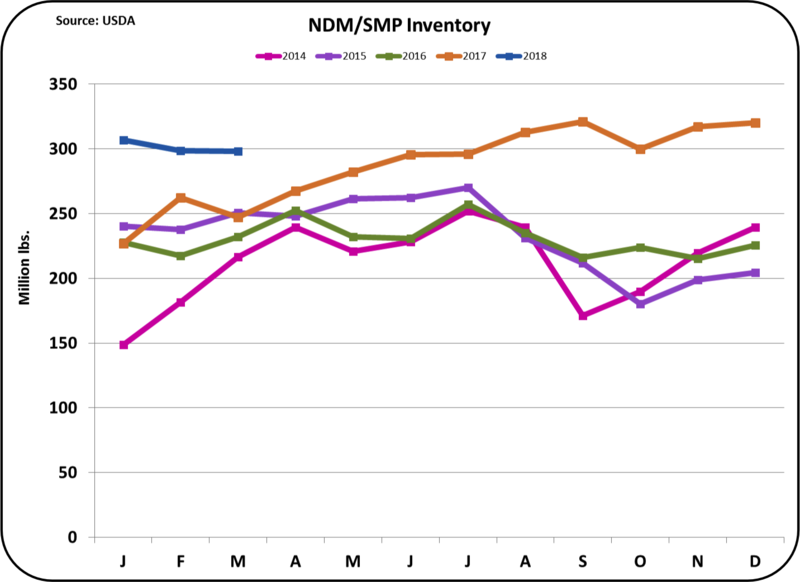 Prices of NDM/SMP remain low (Chart VII). In March 66% of U.S. NDM/SMP was exported. The competitive global price therefore dictates the domestic U.S. price. 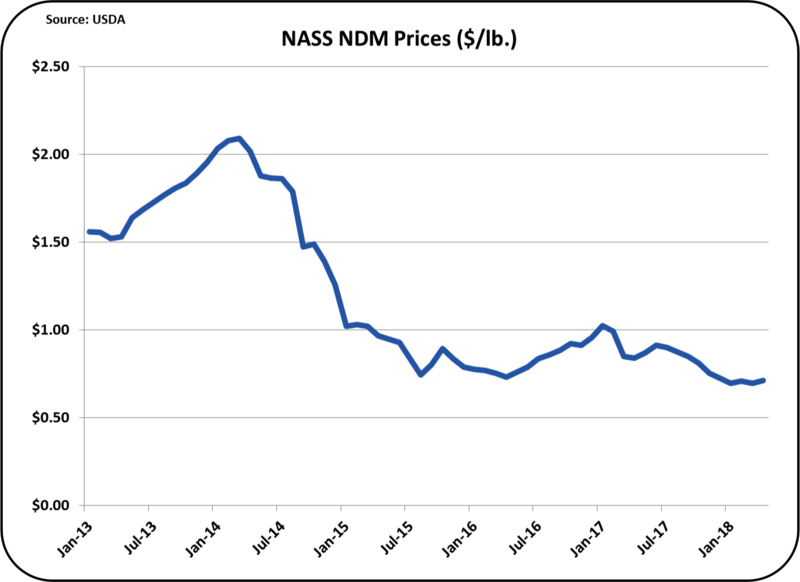 In order to reduce stocks of NDM/SMP, prices will need to competitively low. This means that lower prices will prevail. If the higher level of butter churning continues, there will be more available NDM/SMP to find a home for. Globally, the same scenario is happening. Recently, Canada has become an active player in the international market for SMP exports. They have been forced to sell at very low prices, which only make sense if the margins of butter churning in Canada are high enough to sustain this practice. There will be an upcoming post on the significant expansion of milk production in Canada. 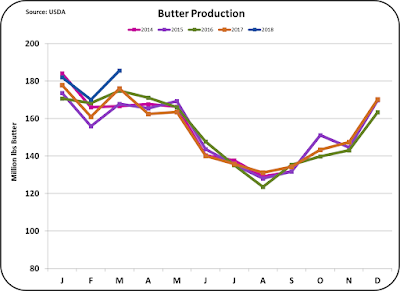 Upcoming May posts will cover the growing export market and its impact, the Canadian dairy industry, and trends in U.S. consumption of fluid milk. All of these things play into the U.S. domestic producer milk price. March Dairy Exports are Amazing! How Much Growth In Milk Production is Needed?